As of July 2018, it's unclear whether the solicitors are still operating here. There's a "to let" sign in the window, and their website gives a contact address of 23 Whitestone Way, but there seemed to be people inside when we went past. An estate agents called Zaar Properties opened some time in the latter half of 2012, in a shopfront that had previously been empty photo. Some time between May and December 2014, Ur Travel, which had previously been a couple of doors down at number 193a photo, moved in too photo of mail redirection sign. Some time between December 2014 and July 2015, Zaar Properties became Axis Properties photo. Ur Travel initially appeared to still be in place, but by September 2015 had moved to Lewisham. 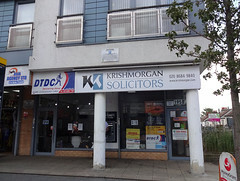 By April 2017, Axis Properties had been replaced by Krishmorgan Solicitors, and a cashpoint had been installed. Last edited 2019-03-21 11:56:23 (version 30; diff). List all versions. Page last edited 2019-03-21 11:56:23 (version 30).